Not too bad, right? I already had the 5 spice powder on hand from a previous dish that Ben and I made, so I figured I would throw it in for some pizzazz. It’s made of, you guessed it, 5 different spices, including cinnamon (which I find to be the most potent), fennel, cloves, star anise (whatever that may be), and white pepper. You definitely don’t need this, but it spruces up the stir fry in an interesting and unconventional way. Threw in the raw zucchini noodles and added about three tablespoons of soy sauce and about a tablespoon of the 5 spice powder. Stirred it around for about a minute. Voila! 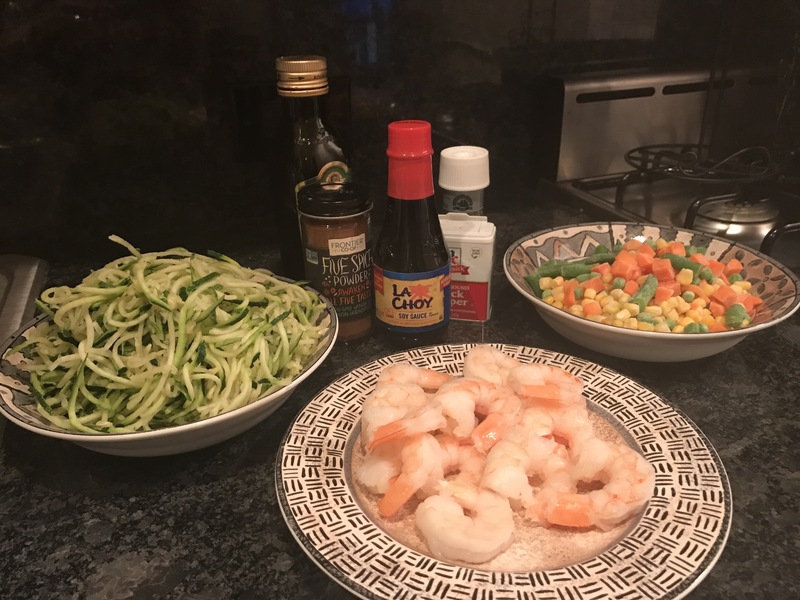 Serve and enjoy your easy peasy lemon squeezy shrimp stir fry! Let me know what you think if you ever give it a shot! I’m also interested to hear what you think of the 5 spice if you use it! You could take this basic recipe and make it any which way, but this was just the easiest option for me at the time. Here’s my one suggestion if you’re into using veggie noodles of any kind: incorporate protein. Especially if you’re physically active. I’ve been training for a half marathon for a few weeks now, and a meal of just noodles alone (like my pasta and mixed greens) does NOT leave me full for very long. This is likely an obvious observation. Other than that, they rock! The 2017 Airbnb Brooklyn Half Marathon Pre-Party + my running prep!